Violet Clauson passed into eternal peace on September 9, 2018, at her home in Emmett of heart failure due to advanced age. She anticipated being reunited with her husband and family in a paradise prepared as a reward for her lifelong Christian faith. Violet Lillian Zimmerman was born on a farm in Bertha, Minnesota, on May 26, 1922, to Robert Zimmerman and Mary Schlegel Zimmerman. The youngest child of eight, she was the darling of her three older sisters. After graduation from high school she followed her sister, Mae, into the nursing field, coming to Idaho to train at the Samaritan Hospital in Nampa where her many friends called her “Zimmie.” After earning her R. N. degree, Violet came to Emmett to work in Mary Secor Hospital. While attending church in Emmett, Violet met a handsome veteran recently returned from the Japanese Occupation after World War II. She married Paul Clauson on April 29, 1947, in the North Side Nampa Nazarene church. They remained faithful members and supporters of the Nazarene Church, even singing duets for worship services. The next twenty-seven years were busy. Paul and Violet had two children, Joanne and Robert. They farmed, built a house on the bench near Paul’s parents, went to work on a cattle ranch near Fort Pierre, South Dakota, then returned to Emmett after enduring several fierce winters. They had two more children, Pamela and Connie, bought a few dairy cows, and Paul started working at Boise Payette Lumber Mill. During one of their many trips to Minnesota to visit Violet’s family, she contracted hepatitis from contaminated food at an amusement park. Her in-laws, Charlie and Ida Clauson, and many friends from the church helped the family until she eventually regained her strength. In 1958 Paul built the Roe Ann Drive In. As he was still working at the mill and doing a little farming, it fell on Violet to be the boss and cook whenever he was not there, as well as doing the bookkeeping and payroll. While the public loved the friendly atmosphere, Paul brought to the business, the employees loved Violet’s soft-spoken gentleness. After Paul’s passing in 1974 she sold the Roe Ann to her son, Bob, but continued working for him. Violet lived alone for the next 44 years, but she wasn’t lonely too much. An introvert, she was happy with her church friends (until they passed), her Bible study group, (until it became hard for her to hear), and her children who had all moved back to Emmett and who gave her lots of grandchildren. 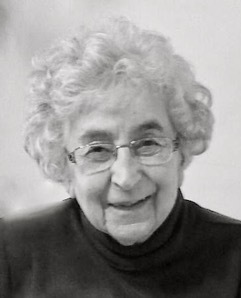 Violet will be remembered for her tenderness in caring for others, her stoicism in supporting her husband’s enterprises, her wit, her aﬀection for babies, her constant prayers, and her love for the Word of God. Violet was preceded in death by her parents, her husband, her seven siblings, and all thirty- three of her cousins. She is survived by her four children, Joanna Clausen, Bob Clauson (Jerilyn), Pam Corn (John), and Connie Edwards (Doug). She is also survived by thirteen grandchildren, eighteen great grandchildren and numerous nieces and nephews. The Nazarene Church on North Washington, Emmett, will be open from 6:00 to 9:00 p.m. on Thursday, September 13 for visiting the family and viewing. The funeral will be at 10:00 a.m. on Friday, September 14, also at the church. The funeral will be followed by a procession to the cemetery for a graveside service where Violet will again take her place next to her husband.